The story of an unusual railway, as it was the only London & North Western Railway branch in an area where Lancashire & Yorkshire Railway branches proliferated. 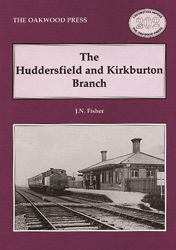 The branch opened for passengers in 1867, just 20 years after the railway first reached Huddersfield. The passenger service was relatively short-lived, and ceased, apart from specials, in 1930. Goods services continued over the whole of the branch for a further 35 years and over a truncated section into the 1970s. In addition to the two terminal stations, there were three other stations along the line at Deighton, Kirkheaton, Fenay Bridge and Lepton. Although constructed and operated as a branch it was originally intended as a through route to Barnsley and the Yorkshire coalfield. It was perhaps in its service to industry where the benefits of the branch were most in evidence. In addition to carrying raw materials in for local industry, and manufactured goods out, the railway connected directly to a number of private sidings and even fully fledged industrial railway systems. The largest and the best private industrial railway in the district served ICI’s Dalton Works. This system consisted of around 20 miles of track. Interest in the branch has already been re-kindled with the re-opening of a passenger station at Deighton. There is also currently a proposal which could result in the relaying of the first nine furlongs of the branch to enable ICI Organics to convey bulk train loads to its works. And so in spite of the early loss of a passenger service from this branch the final chapter may well not have been written and it is just possible that at least a section of the line could again provide some service which will be of benefit to the local economy. A5 format, 80 pages, 66 illustrations.